Check out Sophia's interview with LEVO on quitting her day job and diving into the wild and chaotic world of freelance filmmaking. Images by Jena Cumbo for SOMA Magazine's March 2017 Design Issue, print and digital. My latest short film, The Heaviest Boxes, is entered in a contest to win a free trip to Sundance Film Festival and a year's mentorship. Please watch and vote at this link! "Hailing from Boston and a past filled with struggle, GRLCVLT member beccs is one of our new favorite cool girls. Her one-of-a-kind voice has been heard across the world, from Madrid to Cannes and all the way back to Brooklyn, New York. In her newest video, “Therapy,” “destructive beccs” meets “healer beccs” in a stellar visualization of battling one’s inner demons. In this case, beccs battles “the depth” of her eating disorder. “There was something my body needed to say—music allowed me to go there,” she tells us. Aside from the messages of self-help that beccs has been putting out there to inspire fans, the video itself also displays some awesome girl power moments with a fully female crew and cast of dancers giving some seriously sapphic vibes. Beccs’ debut album, Unfound Beauty, will be released on September 21." Read the full article here. And watch the video below. From beccs' debut EP "Unfound Beauty" set to release September 21st, 2016. 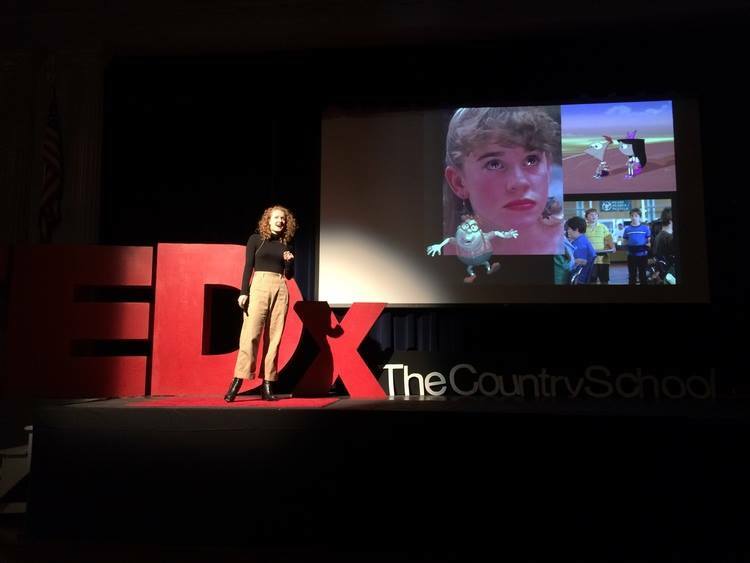 Last month, I had the honor of speaking at my middle school alma mater’s TEDxYouth Art’s Conference. Given the audience, I chose to discuss some of the battles I faced at that age, and continue to face. I am terrified of public speaking and was sick for weeks over the prospect of getting up on this stage, but in the end, it was worth it. People laughed and some people even cried. Most touching of all was speaking with the children afterwards. Several kids approached me, thanked me for saying what I said and told me about their own middle school struggles. That alone made the whole experience exactly as special as it was. I said it then and I’ll say it now, #middleschoolsucks. I was honored to attend this year's Academy Awards with my wonderful company GKIDS, to support our two nominated films Boy and the World and When Marnie Was There. Still getting over how surreal the whole evening was!